Stupidly I didn’t make a mental note of the house number, and although I knew I was on the correct road, I actually walked past the place – twice – without realizing. The high metal wall is a bit of a giveaway, but with no particular markings, it’s just a wall. And, as I mentioned, there really isn’t anything to see, although I did sneak one photograph through a small dark glass spy-hole in the gate. The better view is from around the corner, looking back across Inya Lake. This apparently is where the people used to gather while Daw Suu Kyi was under house arrest, so they could give her encouraging waves, which I imagine she could see and appreciate. 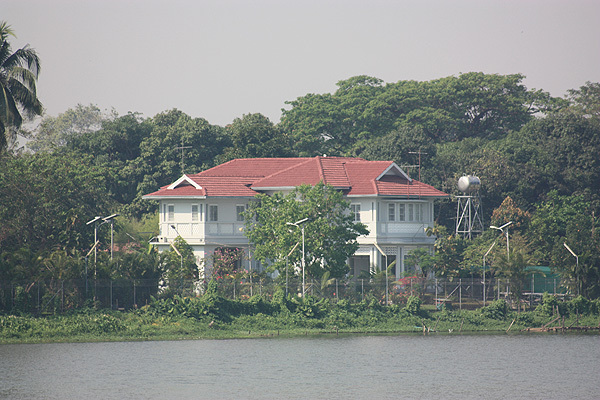 Daw Suu Kyi’s residence from across Inya Lake. 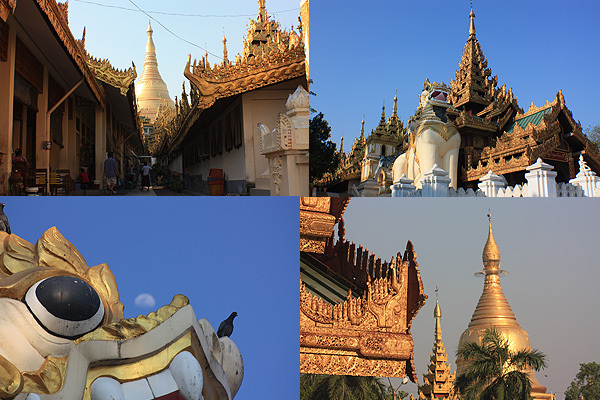 On my way to the house, I’d made a detour to get views of the Shwedagon Pagoda, or Paya. The Paya is the other must-see attraction, but it was not on this day’s agenda. 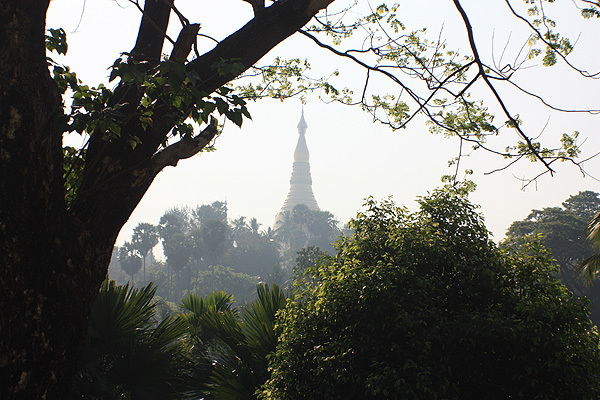 Shwedagon Paya in the early morning haze. 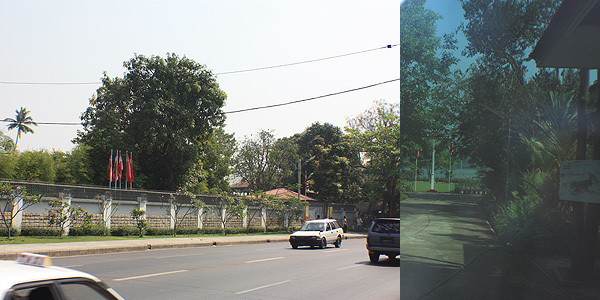 I’d taken a long round-about walk to reach Daw Suu Kyi’s residence, wandering through what is very clearly the rich people’s area, near Inya Lake. Having covered at least six kilometers in the morning, I took a taxi back to the hotel to get a break. Actually, a long break. Yangon afternoons are hot. 38 degrees hot! That’s about 100 degrees for those of you who are as metrically-challenged as the good Dr. Fahrenheit. But the mornings can be a cool 22 deg., and the heat dissipates rapidly after sunset, so overall it’s quite pleasant. Shwedagon Paya from the Southern Gate.